Washington again re-tooled its roster, this time adding the veteran No. 1 goalie that it has been missing over the past couple of seasons. Tampa Bay held on to its own talent while Carolina added the pass-first, puck-moving defenseman it hopes will improve the power play. Winnipeg began building its organization and Florida spent about $30 million to complete its overhaul. For a team that surged to the top of the Eastern Conference standings for the second straight season, Capitals general manager George McPhee made some radical changes this summer that earned him plenty of accolades across the League. Most notable is what McPhee was able to do with Washington's goaltending. McPhee traded Varlamov to Colorado for a first-round pick and a conditional second-round pick on July 1 and a day later signed Vokoun to a one-year contract for the bargain price of $1.5 million. Vokoun was thought to be a hot commodity on the free agent market and many believed he'd get a multi-year, multi-million dollar deal. However, after seeing the Capitals up close for several seasons while playing in Florida, Vokoun wanted to come to Washington because he wants to win. He has played in only 11 playoff games and none since 2007. He'll enter the season as the favorite to win the No. 1 job with last year's No. 1, Michal Neuvirth, likely falling in line behind him. Holtby will shuttle between AHL Hershey and Washington again this season. The rest of McPhee's moves were aimed at helping the Capitals' depth, with Brouwer or Ward likely to join Laich (signed to a new six-year contract) and Semin on the second line. Halpern figures to center the fourth line while Hamrlik will replace Hannan on the blue line. General manager Steve Yzerman's big task this summer was to lock star center Steven Stamkos into a long-term deal with the Lightning. It took longer than expected, but Yzerman was able to get it done, signing Stamkos, the NHL's leading scorer over the past two seasons, to a five-year extension worth $37.5 million. Yzerman's other self-assigned tasks this summer were to keep most of the Lightning's other free agents, including defenseman Eric Brewer, forward Teddy Purcell and goalie Dwayne Roloson. He was successful, but the signings didn't give Yzerman the wherewithal to go too deep into the unrestricted free agent market, though he did dabble in the pursuit of center Brad Richards. It shouldn't matter. The Lightning made a run to Game 7 of the Eastern Conference Finals this past spring and return most of the talent that got them there, including the big three of Stamkos, Martin St. Louis and Vincent Lecavalier. Yzerman added Shannon, Pyatt, Gervais and Gilroy to fill out the depth and brought in Garon to replace Smith as Roloson's backup. There could be room for Ashton on the NHL roster, but otherwise the Lightning have 12 forwards, eight defenseman and two goalies under contract and almost $5 million left under the salary cap. Hurricanes general manager Jim Rutherford has jumped into the free agent waters on a couple of occasions this summer and created a splash by signing Kaberle to a three-year contract on July 5. Kaberle has to be able to help the Hurricanes' power play, which was 24th in the NHL last season and no longer has the services of Cole, who signed a four-year contract with Montreal. With Kaberle on board and Joni Pitkanen re-upping for three more years, the Canes' defense looks strong on paper. Adding Brent gives the Hurricanes a fourth-line center behind Eric Staal, Tuomo Ruutu and Brandon Sutter. However, the hole left by Cole's departure still looms large for the Hurricanes. It's safe to assume that Calder Trophy winner Jeff Skinner will improve on his 63 points to make up some of the difference, but the Hurricanes are going to need someone to step up to help Staal, Skinner, Jokinen and Ruutu in the scoring department. That could be Stewart, who had a career-best 39 points with the Thrashers last season. It'd be even better for the Hurricanes' long-term future if youngsters like Boychuk, Dalpe and Bowman become full-time NHL contributors this season. Since the move from Atlanta became official, the Jets have been developing their organization from the top down, with the latest being the release of their logos. In the middle of it all, general manager Kevin Cheveldayoff has been able to re-make the team with some significant changes, including the additions of Winnipeg natives Fehr and Meech. However, Cheveldayoff's biggest move this summer was re-signing Andrew Ladd to a five-year contract. Ladd, 25, was the Thrashers' captain last season and all signs point to him taking on the same role in Winnipeg. Once restricted free agent defenseman Zach Bogosian re-signs, the Jets will have a core of 10 players who are all 26 years old or younger. Blueliners Dustin Byfuglien and Tobias Enstrom were all-stars last season, though Byfuglien faded as the season wore on. Evander Kane, who turns 20 on Aug. 2, saw his point total increase from 26 to 43 as a sophomore. Bryan Little, Alexander Burmistrov, Blake Wheeler and Nik Antropov join Kane, Ladd and Fehr as the Jets' core forwards. Antropov, 31, is the oldest skater on the team. Panthers general manager Dale Tallon had money stashed in his pockets that he had to burn this summer in order to reach the salary cap floor of $48.3 million. He signed eight veteran players, then pulled off a draft day blockbuster and a second trade on July 1 to completely overhaul Florida's roster. Tallon also brought in rookie head coach Kevin Dineen and tabbed ex-Thrashers coach and veteran NHL assistant Craig Ramsay to be his top confidant. Dineen spent the last six seasons as a head coach in the AHL, where he won better than 61 percent of his games. Campbell and Jovanovski will now anchor the Panthers' blue line and help guide youngsters Dmitry Kulikov and Gudbranson, who signed his entry-level contract this summer and should compete for a spot on the opening night roster. 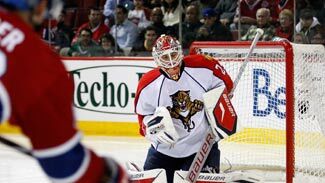 Theodore replaces Vokoun in net with Markstrom likely ready to compete with Scott Clemmensen for the backup role. Tallon bolstered the Panthers' depth on the wings by trading for Versteeg and signing Kopecky, Upshall, Bergenheim, Bradley and Fleischmann. He had Versteeg and Kopecky while he was the GM in Chicago. Goc will help the Panthers at the center position and likely replace Reasoner, who left to sign with the Islanders.